Tradition. Innovation. Performance. Craftsmanship. 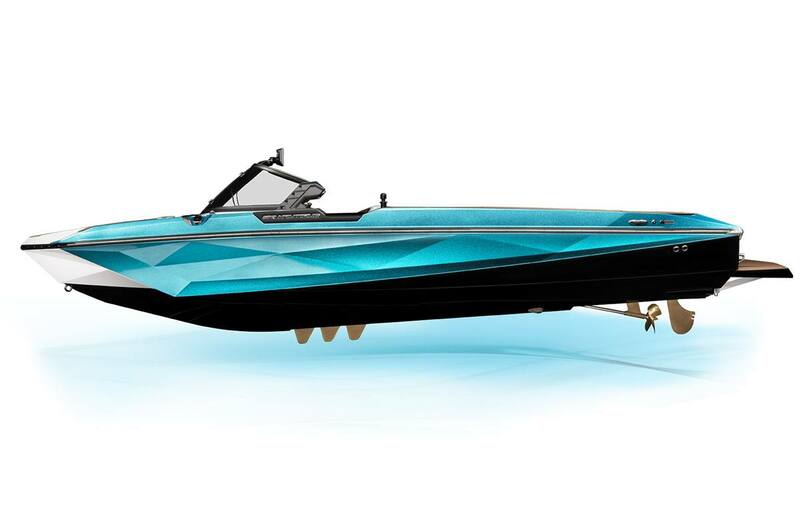 When a rare combination of elements like these come together in a ski boat, it's sure to provide a waterskiing experience unlike anything before. 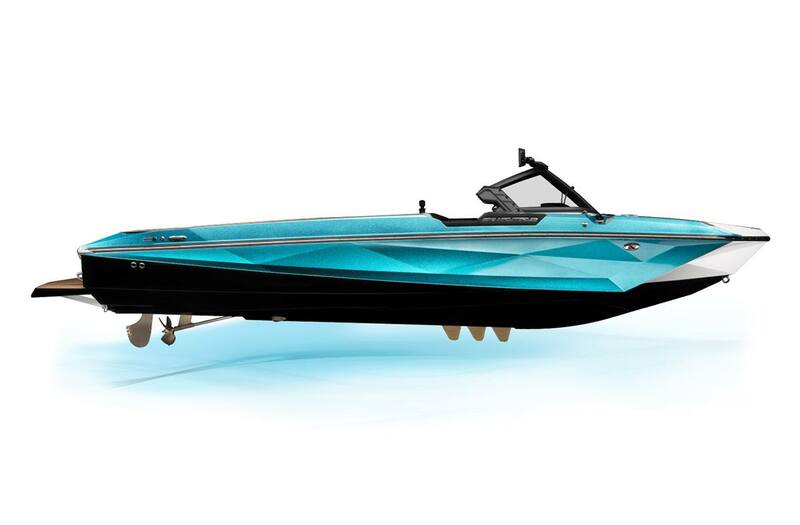 With a blended carbon fiber and fiberglass construction method that creates the perfect balance of strength and weight, this new icon is lighter than any other ski boat on the market and creates the softest wakes imaginable. 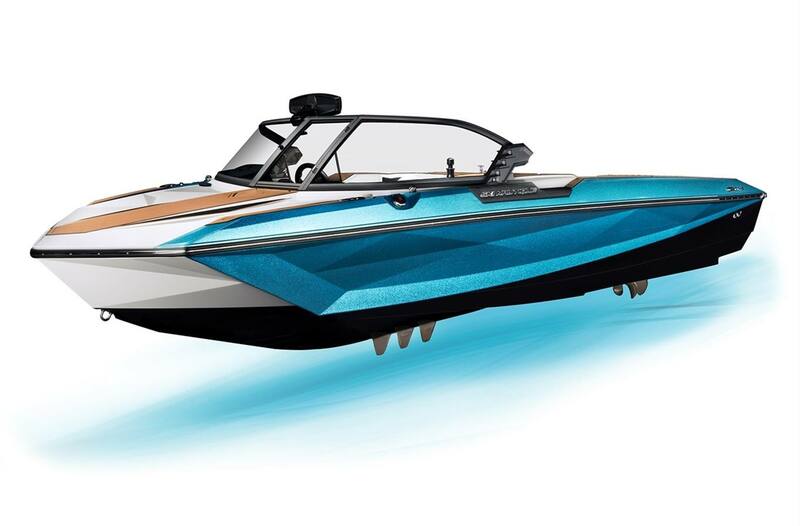 Add that to the brand-new MicroTuner technology and the All-New 2019 Ski Nautique is the best waterski boat ever created. 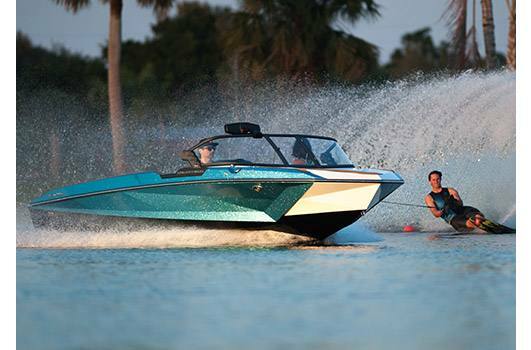 A new era in 3-event waterskiing is here. 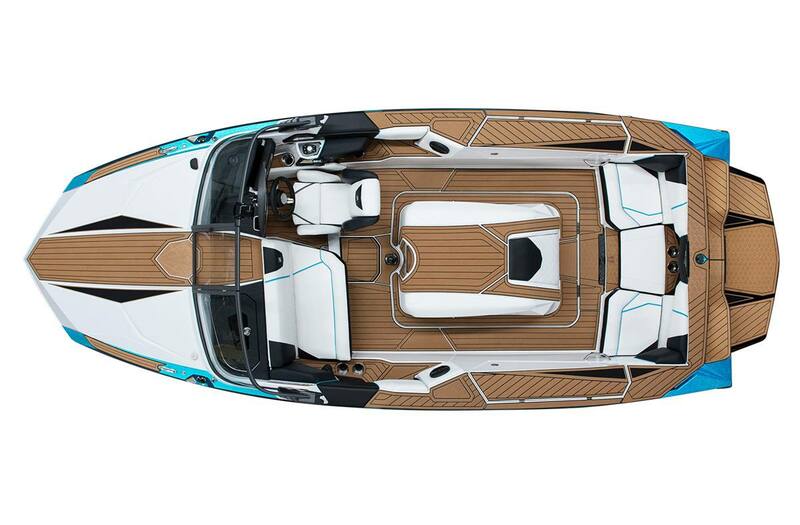 Aggressive styling and striking lines make up the jaw-dropping exterior of the new Ski Nautique hull. 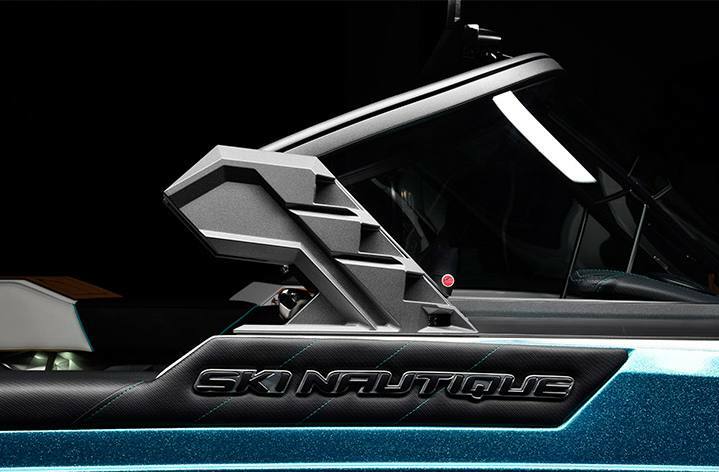 For the first-time in history, Nautique has incorporated carbon fiber into the build process of the Ski Nautique in order to reduce weight. A proprietary method of integrating Carbon Fiber along with fiberglass into the cored hull structure allowed our engineering team to find the perfect balance of strength and weight. Spray diffusers and the reverse chine areas of the hull force the spray of the boat parallel with the water surface so it doesn't disturb the wakes or bounce up and create unwanted spray for the skier. 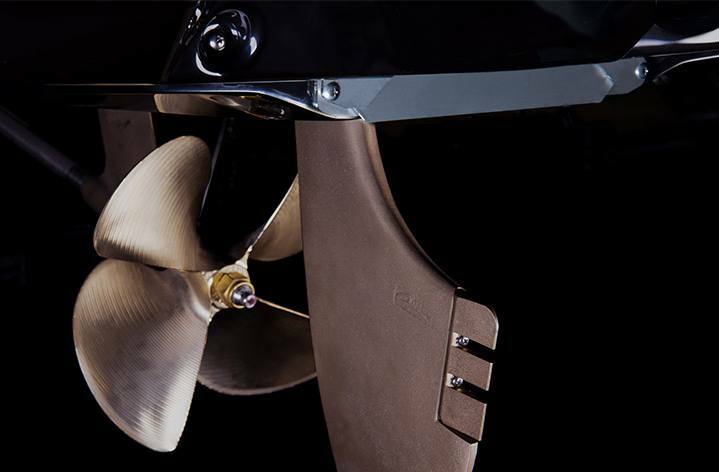 There are also specific hull features that create lift, keeping the boat's running attitude at the perfect angle to lessen the amount of wake it creates. 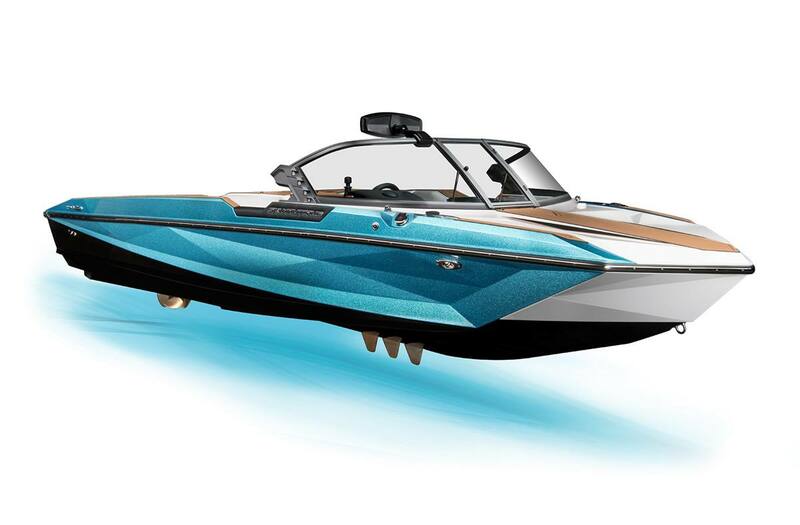 Maximizing the driving experience played a major role in the design of the new Ski Nautique. The asymmetrically-designed dash provides numerous benefits, with the off-set 12.4" LINC Panoray Touchscreen ready to control all of your major functions. 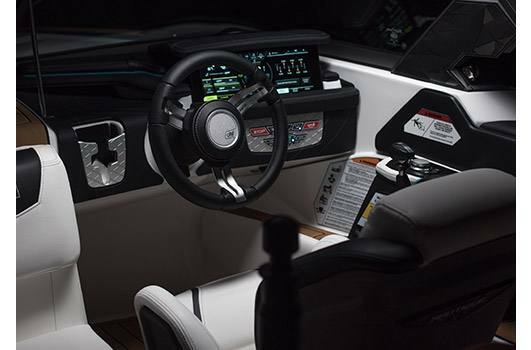 The Helm Command rotary dial gives you the ability to breeze through menus and settings while sitting comfortably in the driver's seat, and a pocket on the left side of the steering wheel keeps your phone protected and doubles as a place to keep your boat's drain plug. 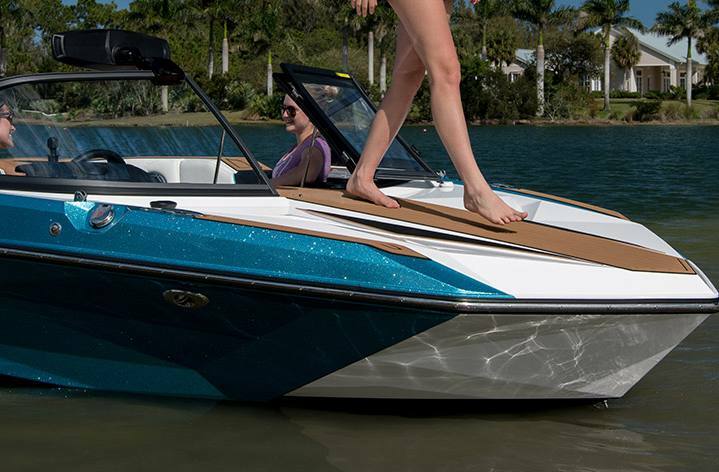 The Ski Nautique has the best visibility of any ski boat on the market, with a clear view of the course and your surroundings thanks to the low profile dash and re-configured seat and windshield heights. LINC Panoray Touchscreen: The 12.4 inch touchscreen provides you with all the information you need and the ability to change settings quickly and easily. Choose your 3-event discipline along with your personalized settings and the LINC Panoray automatically activates the HydroGate® and MicroTuners® to the optimal settings. The LINC Panoray allows you to choose pull type, change jump letter, map your course, adjust trick ballast and puts you completely control in a beautiful, intuitive display. 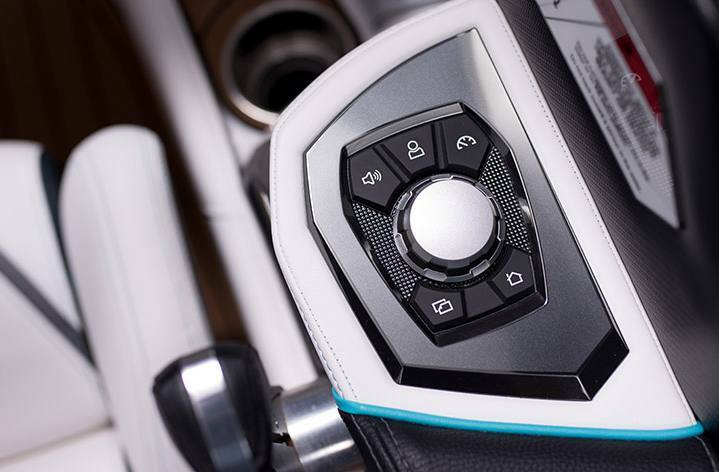 Helm Command: Comfortably positioned right above the throttle, our Helm Command rotary dial gives you the ability to quickly breeze through menus and settings on the LINC Panoray Touchscreen while sitting comfortably in a driving position. Bow Storage: The massive storage area inside the closed bow of the Ski Nautique is perfect for storing all of your essentials and much more. Finished off with SeaDek and incorporating courtesy lighting, your items are easily accessible by flipping up the observer seat. Bow Entry: Easily enter the boat from the bow using the SeaDek covered area that gives you access to the center windshield walk-through. 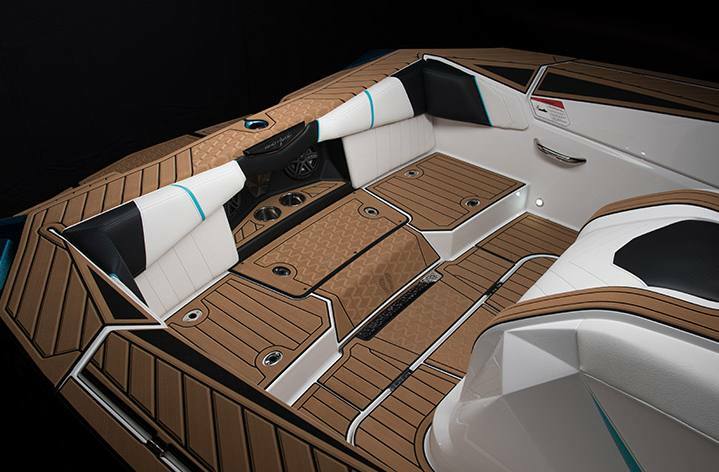 Removable Rear Seating: The stern seating can be configured multiple ways in the new Ski Nautique. 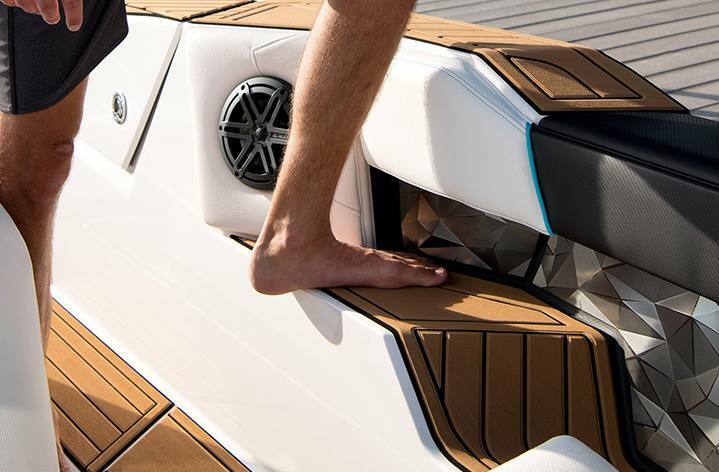 Simply removing only the center seat reveals a built-in step to the transom, or eliminate the side seats as well to create a larger SeaDek covered platform area. 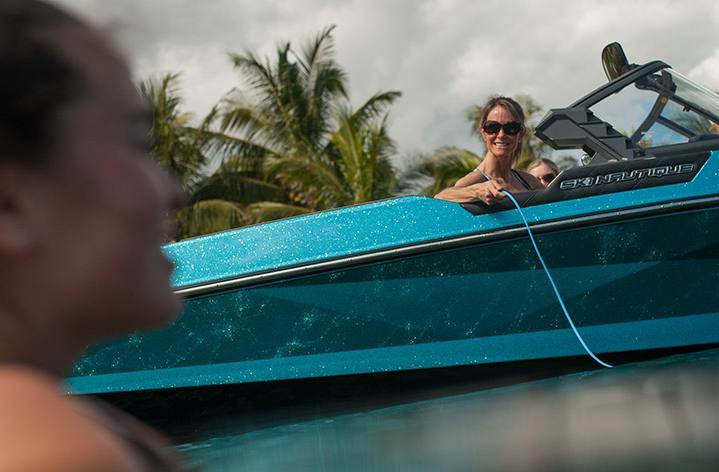 Gunnel Notch-Out: Designed to create a better connection to the skier, the notch out in the gunnels of the Ski Nautique gives the driver or passenger better ability to communicate with the skier in the water with great visibility while the boat is stationary. Awareness Camera: The Nautique Awareness Camera gives the driver a rear-facing view of what's happening behind the boat displayed on the LINC Panoray screen. Windshield End Cap: Not only does this stylish windshield end cap provide support for the windshield, it also houses multiple other functions. 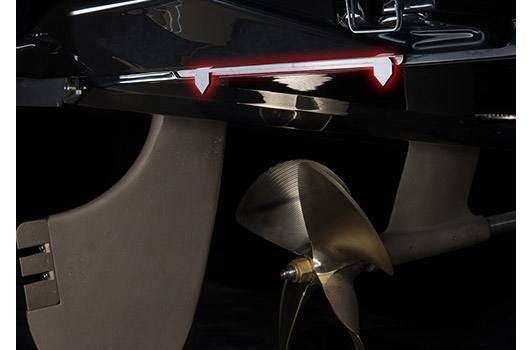 Navigation and docking lights are incorporated into the assembly, along with lock-in supports for the rear arms of the bimini as well. 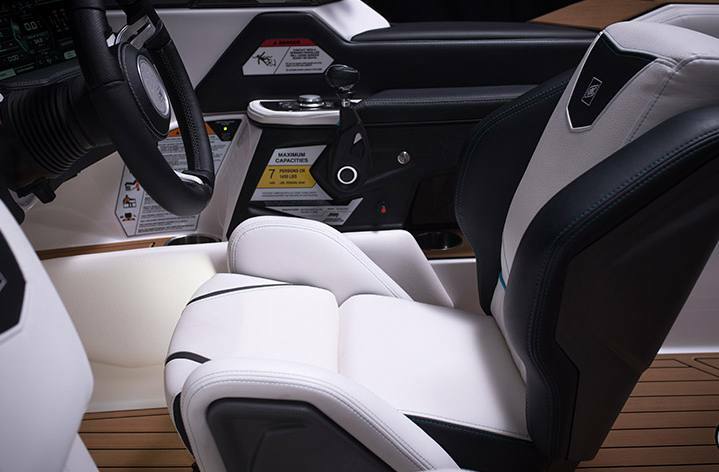 Helm Seat: Nautique's unique helm seat provides comfort, support and adjustability for the best driving experience possible. Situated lower in the cockpit, the helm seat is aligned to give the driver the perfect line of sight through the windshield. 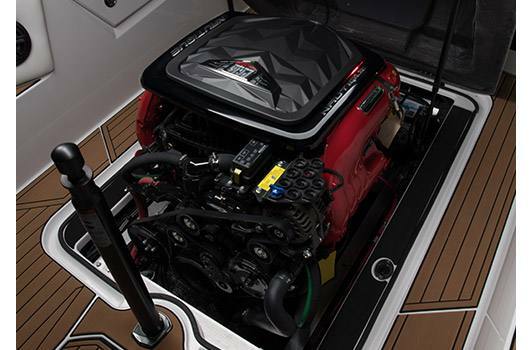 Ski Locker Storage: Located on each side of the boat, the ski lockers provide you with a safe place for your skis, ropes and any other gear you want to take out on the water. 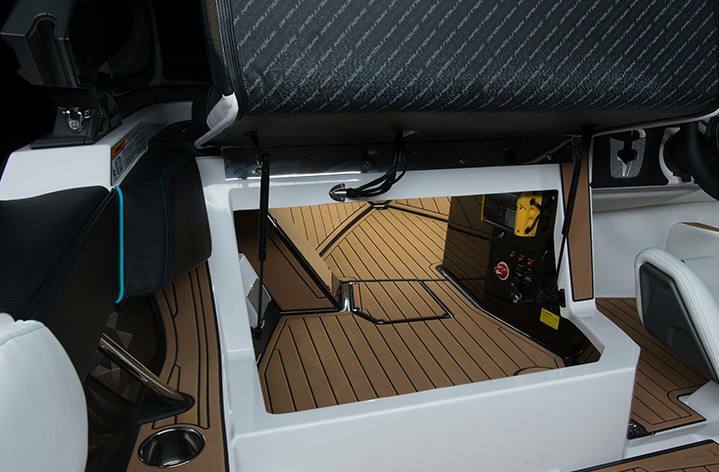 The hull styling pushed these storage areas out further to add more interior space, and they also come with the ability to be locked for added security. Side Step: When parked against a dock, our side steps incorporated into the hull deck design give passengers an easy way to enter or exit the boat on either side. 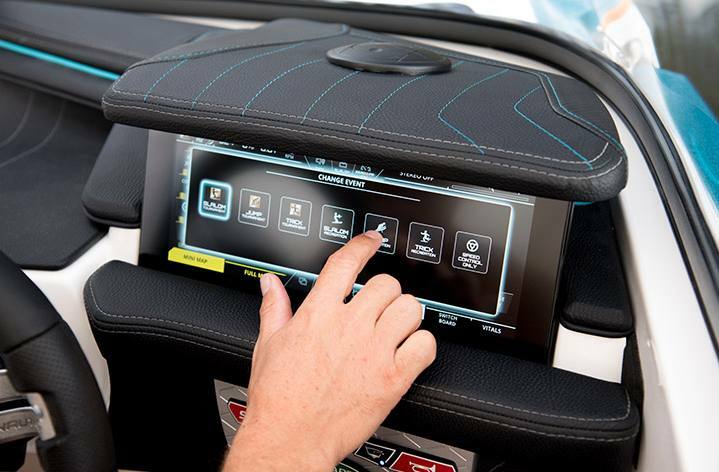 Automated Hydrogate®: Our patented HydroGate fine-tunes the running surface of the Ski Nautique automatically based on your user settings, giving you the perfect pull for whichever 3-Event discipline you're participating in. With the ability to lock the HydroGate in 10 positions from stowed to completely deployed, you now have the ability to customize with more accuracy than ever before.